Sea travel expanded the horizons of many European nations and created prosperity and the conditions for the Enlightenment. 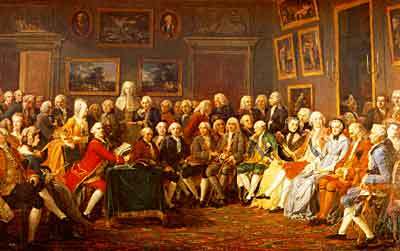 In turn, the Enlightenment ideals of liberty, equality, and justice helped to create the conditions for the American Revolution and the subsequent Constitution. Democracy was not created in a heartbeat. In a world where people were ruled by monarchs from above, the idea of self-government is entirely alien. Democracy takes practice and wisdom from experience. Where did this democratic tradition truly begin? The ideas and practices that led to the development of the American democratic republic owe a debt to the ancient civilizations of Greece and Rome, the Protestant Reformation, and Gutenberg's printing press. But the Enlightenment of 17th-century Europe had the most immediate impact on the framers of the United States Constitution. Europeans of the 17th century no longer lived in the "darkness" of the Middle Ages. 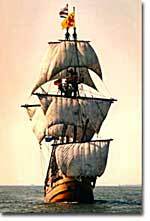 Ocean voyages had put them in touch with many world civilizations, and trade had created a prosperous middle class. The Protestant Reformation encouraged free thinkers to question the practices of the Catholic Church, and the printing press spread the new ideas relatively quickly and easily. The time was ripe for the philosophes, scholars who promoted democracy and justice through discussions of individual liberty and equality. The ideas of 18th-century philosophes inspired the Founding Fathers to revolt against what they perceived as unfair British taxation. 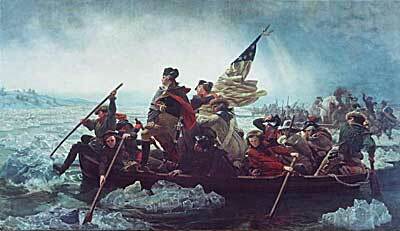 Washington Crossing the Delaware is one of the most famous depictions of the American Revolution. One of the first philosophes was Thomas Hobbes, an Englishman who concluded in his famous book, Leviathan, that people are incapable of ruling themselves, primarily because humans are naturally self-centered and quarrelsome and need the iron fist of a strong leader. Later philosophes, like Voltaire, Montesquieu, and Rousseau were more optimistic about democracy. Their ideas encouraged the questioning of absolute monarchs, like the Bourbon family that ruled France. Montesquieu suggested a separation of powers into branches of government not unlike the system Americans would later adopt. They found eager students who later became the founders of the American government. The single most important influence that shaped the founding of the United States comes from John Locke, a 17th century Englishman who redefined the nature of government. Although he agreed with Hobbes regarding the self-interested nature of humans, he was much more optimistic about their ability to use reason to avoid tyranny. In his Second Treatise of Government, Locke identified the basis of a legitimate government. According to Locke, a ruler gains authority through the consent of the governed. The duty of that government is to protect the natural rights of the people, which Locke believed to include life, liberty, and property. If the government should fail to protect these rights, its citizens would have the right to overthrow that government. 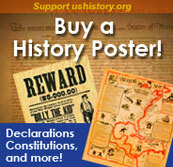 This idea deeply influenced Thomas Jefferson as he drafted the Declaration of Independence. Ironically, the English political system provided the grist for the revolt of its own American colonies. For many centuries English monarchs had allowed restrictions to be placed on their ultimate power. The Magna Carta, written in 1215, established the kernel of limited government, or the belief that the monarch's rule was not absolute. Although the document only forced King John to consult nobles before he made arbitrary decisions like passing taxes, the Magna Carta provided the basis for the later development of Parliament. Over the years, representative government led by a Prime Minister came to control and eventually replace the king as the real source of power in Britain. The ideas of the French Enlightenment philosophes strongly influenced the American revolutionaries. French intellectuals met in salons like this one to exchange ideas and define their ideals such as liberty, equality, and justice. The Petition of Right (1628) extended the rights of "commoners" to have a voice in the government. The English Bill of Rights (1688) guaranteed free elections and rights for citizens accused of crime. Although King George III still had some real power in 1776, Britain was already well along on the path of democracy by that time. The foundations of American government lie squarely in the 17th and 18th century European Enlightenment. The American founders were well versed in the writings of the philosophes, whose ideas influenced the shaping of the new country. Thomas Jefferson, George Washington, James Madison, and others took the brave steps of creating a government based on the Enlightenment values of liberty, equality, and a new form of justice. More than 200 years later, that government is still intact. Thomas Hobbes said that humans are savages who need a strong leader to tell them what to do. Hard to believe he was just a stuffed orange cat.